A little bit of 80's. A little bit of reggae. A little bit of show tunes. A little bit of AWESOMENESS. 2. Tina Turner "What's Love Got To Do With It?" 3. Michael Jackson "The Way You Make Me Feel"
4. Red Hot Chili Peppers "Higher Ground"
5. Sarah Bareilles "Love Song"
6. Bob Marley "Is This Love"
8. 4 Non Blondes "What's Up"
9. Des'ree "You Gotta Be"
10. Israel "IZ" Kamakawiwo'ole "Somewhere Over the Rainbow"
11. 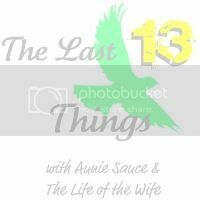 Rent "Take Me or Leave Me"
Aunie Sauce's "Thursday 13" and The Life of the Wife's "The Last Thing I..."
We want to know 13 of the last things you did. The last thing you ate? The last thing you thought? LET US KNOW next Thursday! See you here! love your list, especially the bob marley! i just posted my list - SO hard to narrow it down to 13!!! #2 and #11 are my two favorite songs! Ah so good! And can't wait for you and Jenna's link up!! I LOVE What's Up by 4 non blondes. So happy to see it on your list. AHHHH Rent & 4-Non-Blondes are definitely on my list too. Excellent. Can we go on a road trip together and YOU make the playlist? Okay awesome. This list is amazing - but the fact that you ended it with wizo....best.list.ever! Love some of those songs especially Isreal. Can't wait till next weeks. Sorry I didn't do my own Thursday 13 this week. Most of these songs are in rotation on my ipod. You have great taste girly!